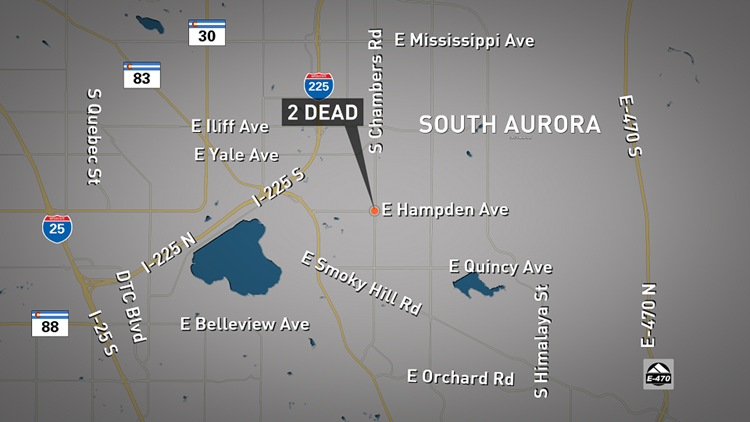 Two people are dead after a wreck at Chambers Road and Hampden Avenue in southern Aurora Saturday morning. Details are still scarce in the case. AURORA, Colo. — Two people are dead after a Saturday morning crash in Aurora at the intersection of Chambers Road and Hampden Avenue, according to law enforcement. The crash happened at 6:30 a.m., according to Lt. Lanigan with the Aurora Police Department. The intersection of the crash is well-traveled and surrounded on all sides by businesses. According to Lanigan, the cause of the crash was definitely speed. The driver of the car that caused the crash passed away, Lanigan said. It was just a single car involved with two people inside - both men inside died. No word on their ages. Alcohol may have been involved, but law enforcement is waiting for a toxicology report. The driver of the vehicle headed north on South Chambers Road at a high rate of speed, according to APD. As the Sentra the person was driving crossed over East Hampden Avenue, the driver lost control of the vehicle and it left the road, striking a tree on the east side of the street, police said. The vehicle was then cut in half by the tree, APD said. Both the driver and the rear-seated passenger were pronounced dead on scene. A third person in the vehicle, after the crash, took off from the scene and was found seven hours later at a local hospital with severe injuries, according to police. The intersection was never closed, Lanigan said. The parties involved have yet to be identified.